Nichole Varga, R.N, B.S.N, is a highly experienced and skilled medical professional. Nichole has practiced nursing for more than eight years, with the uttermost distinction and dignity. She has earned numerous awards, accolades, and recognitions over the years, for her contributions to the nursing and cosmetic field. Staying true to her core belief that being the best requires deep devotion, passion, and commitment having earned her Bachelor’s Degree in Nursing, she is currently enrolled in a top Nurse Practitioner’s program. Nichole has devoted most of her career to cosmetic nursing and has mastered multiple procedures. Nurse Varga comes to Weight Loss and Vitality after working in a successful Plastic Surgeon practice in Richmond, VA. She is a master level injector in several areas, including master training with Allergan, Galderma, ArqueDerma® and Instatox®. She is also highly experienced and certified in various lasers, skin care products, and other non-surgical aesthetic procedures. 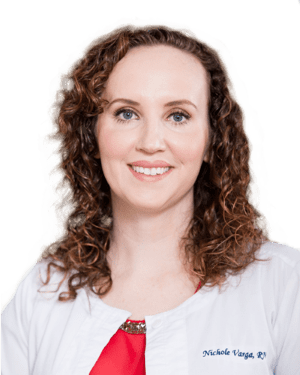 Nichole finds it extremely rewarding to be able to enhance her patient’s natural features and enjoys tailoring treatments to each of their individual needs. When Nichole is not at work she is enjoys spending time with her husband and two labs (Zoe and Remi). When there is time away from her studies and work she love to travel.